A new network named UI-Guest will provide free wireless service to campus visitors, replacing the previous guest wireless service, AT&T. Visitors can use the new UI-Guest network now. Guests can take advantage of the service by selecting UI-Guest when connecting to a wireless network on campus. They will be asked to confirm the connection to the network and agree to UI-Guest's terms of service. The ITS Help Desk is available at 319-384-HELP (4357) to provide support. Like most guest networks in public places, UI-Guest is not encrypted. If personal information such as bank account, credit card, or Social Security numbers will be shared, take precautions to protect data by using a Virtual Private Network (VPN) and making sure websites are secure (look for HTTPS in the URL). UI-Guest should not be used to access data protected by privacy laws such as HIPAA and FERPA. Similar to a public or home network, some UI resources are not accessible from the UI-Guest network. 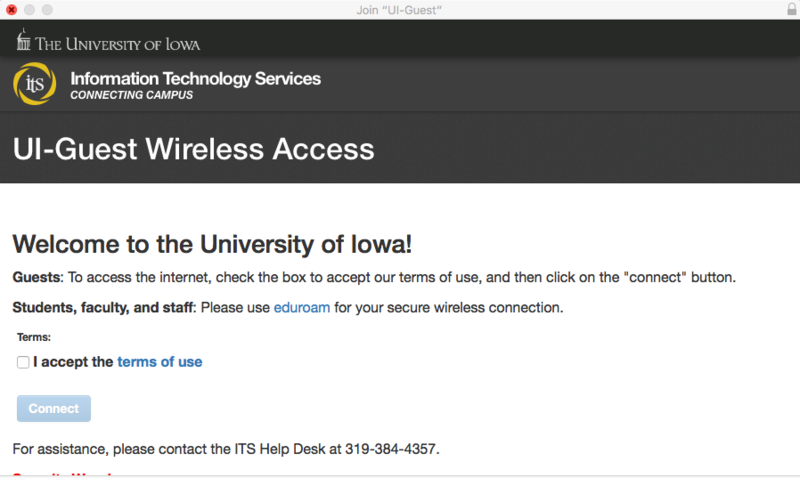 For optimal service and security, UI students, faculty and staff should use the eduroam wireless network by logging in with their UI credentials (<yourhawkid>@uiowa.edu and password). eduroam is a secure network that allows UI users to access key university resources, such as file shares and printers. UI DeviceNet is available for wireless-only devices, such as gaming systems, that do not have capabilities to securely connect to eduroam. Devices must be registered (see how to connect to UI DeviceNet).